I digress. 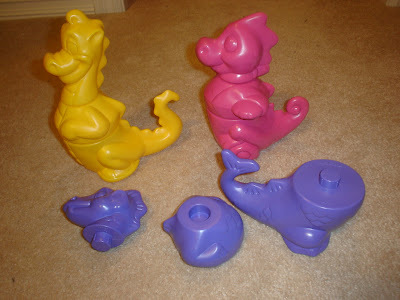 Can I introduce to you one of The Princess's presents, good ol' TupperToys. Made in the US of freakin' A! Dance of joy....dance of joy.....I don't know if they are STILL made in the US tho, they say 1992 on them. Not only are they awesome fun and adorable (I remember those old elephants etc) but they aren't made in China. Ahhh I have something other than socks for her! BTW of course you have already guessed I will email Tupperware and ask where the products are made now..
Tupperware was known, at a time when women came back from working during World War II only to be told to "go back to the kitchen", as a method of empowering women, and giving them a toehold in the post-war business world. The tradition of Tupperware's "Jubilee" style events continues to this day, with rallies being held in major cities to recognize and reward top-selling demonstrators, managers and distributorships. On May 9, 2007 Tupperware announced Brooke Shields as the celebrity spokesperson for Tupperware’s "Chain of Confidence" campaign in the USA. The campaign invites women to celebrate the strong bonds of female friendships and the self-confidence derived from those relationships.ChainOfConfidence.com serves as an online community where women can share their confidence stories with one another and join an online discussion about the importance of female friendships and confidence.As part of Chain of Confidence, Tupperware is donating over one million dollars to the Boys & Girls Clubs of America to sponsor SMART Girls—a program dedicated to promoting confidence in young girls ages 8-17. I was beginning to get beyond frustrated this weekend. I literally spent a half an hour in the doll aisle reading boxes. Mike had to take his tire in to get fixed so I can time to spare LOL! I think the Walmart worker thought I was a crackpot. Both sides, every doll. Not ONE that wasn't made in China. In another aisle I found some Crayola markers made in the US, and some sparkle glue made in Taiwan. Deee-pressing. What really made me sad is there were some horses (oh, she loves her horses) that kids can literally sit on (up to 80 lbs) and pretend to ride. So the Princess is sitting on one and just looooving it. She kept trying to take it back off the shelf, and its bigger than her. Soo cute. She's trying to tuck this damn 3 foot horse under her arm and take it home. Sigh. You know, you just can't win. Damned because you buy your children possibly toxic toys or damned because you can't get them what they really want to play with.